All pool filters are different and require unique steps to be properly maintained. Sand filters are the lowest maintenance type of pool filter and typically only need attention every few years. When it comes to sand filters, the sand particles are specially graded to collect dirt and other organic matter that makes its way into your water. At Aqua Pool, we recommend 45-55mm silica sand, as this sizing is able to capture dirt and debris into the 20-100 micron range! A good rule of thumb when it comes to swapping out the sand in your filter is to plan for a change every five to six years or if you notice that your filter system requires frequent backwashing to perform well. Also, keep a lookout for calcium deposits in your pool as water balance issues can accelerate filter deterioration. If you notice sand in your pool water and you know it wasn’t brought in on the feet of recent swimmers, there’s a high chance that you have a broken lateral or standpipe. If it’s a small amount of sand, it may be attributed to overfilling your filter. Sand filters rarely leak but if a leak occurs around the multiport interface or valve, it needs immediate attention. 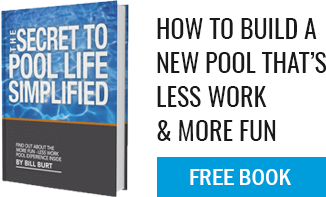 Talk to one of our local professional pool technician about your needs. If the pressure on your sand filter reads eight to ten pounds above the clean, it is time to backwash your system. To do so you’ll need to reverse the flow of filter and send water backwards until clear. If backwashing doesn’t fix your problems and the flow slows while the pressure rises, a deep cleaning may be necessary. Doing a deep cleaning once a year is a great way to help remove debris, dirt, and rebalance sand for the ultimate clean pool. Whatever your pool questions are, at Aqua Pool, we are happily standing by to help you. Filter systems are integral parts of how a clean pool works and our staff is ready to assist you with your needs!